Successfully Added Meizu M3 Note Smartphone - Android OS, 5.5 Inch FHD Display, Octa Core CPU, 2GB RAM, Fingerprint Scanner, 13MP Camera (Silver) to your Shopping Cart. The Meizu M3 Note is very iphone like with its single navigation button that is also a super fast fingerprint scanner. This single button takes the place of home and back navigation buttons as well as providing an extra layer of security that's quick and easy to use. The curved edges, 2.5D screen, and full metal body give this cell phone a very stylish look and a premium feel, that is a welcome addition to such an affordable handset. With its custom Flyme OS interface (Based on Android) you get a clean minimalist looking system that's intuitive to use. All this screams quality and with the M3 Note Meizu delivers it at a surprisingly cheap price. A 5.5 inch full HD screen brings vivid colors and great viewing to this Android smartphone. With good viewing angles and great contrast, the screen is easy to see even in bright light so you won't have any problems using it on a sunny day. Running on a MediaTek Helio P10 octa-core processor, that boasts four cores running at 1.8GHz and a further 4 at 1GHz you'll find this smartphone bring an impressive performance. The Meizu M3 Note has 2GB of RAM and an ARM Mali-T860 GPU so it can handle the most popular games with high frame rates and zero lag so you'll have an enjoyable and immersive user experience. This unlocked dual SIM smartphone lets you have two SIM cards active simultaneously, or you can opt to replace one of them with up to 128GB of additional storage space via a micro SD card. With 4G frequencies FDD-LTE 1800/2100/2600MHz, TDD-LTE (38/39/40/41: 2555-2655MHz) supported you'll be able to get quick and fast network connections so streaming HD content, and uploading photos or documents is swift and straightforward. If you're a frequent traveler than that extra SIM slot will bring greater network coverage as you'll be able to connect to two providers at once, great for holidays or business travel. A large 4100mAh battery brings a long usage time while 13KMP rear camera lets you snap quality photos. 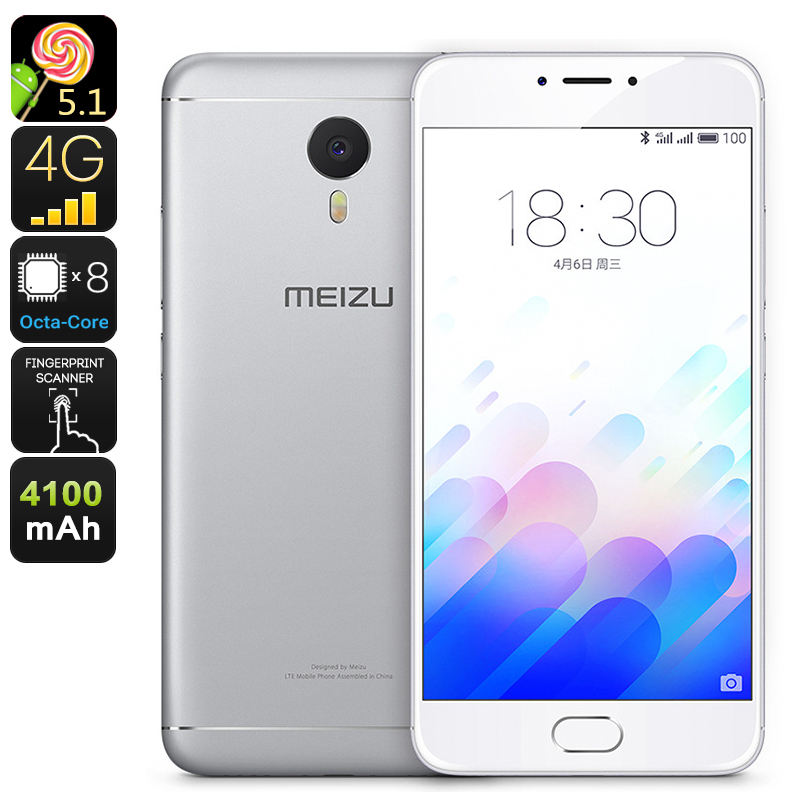 With all this and much more, the Meizu M3 Note is a well-designed phone with some fantastic features and an affordable price tag, making it a great choice for discerning users on a budget. The Meizu M3 Note comes with a 12 months warranty, brought to you by the leader in electronic devices as well as android smartphones..
Arabic: - 5-بوصة الذكي - Chinese Simplified: - 5 英寸智能手机 - Czech: - 5, 5palcový Smartphone - Dutch: - 5-inch-Smartphone - French: - 5 pouces Smartphone - German: - 5-Zoll-Smartphone - Hebrew: - 5-inch החכם - Hindi: - 5-इंच स्मार्टफोन - Hungarian: - 5-lassan mászik Smartphone - Italian: - Smartphone da 5 pollici - Japanese: - 5 インチのスマート フォン - Korean: - 5 인치 스마트폰 - Malay: - Telefon pintar 5-inci - Norwegian Bokmål: - 5-tommen Smartphone - Romanian: - Smartphone de 5 inch - Russian: - 5-дюймовый смартфон - Spanish: - Smartphone 5 pulgadas - Thai: - สมาร์ทโฟน 5 นิ้ว - Turkish: - 5-inç Smartphone - Vietnamese: - 5-Inch Smartphone.